Included in this package are two 6ft stainless steel washing machine hoses, suitable for both hot and cold water supply. The extra-thick internal rubber washers prevent leaks from ever developing. 1. Make sure supply taps are turned OFF. 2. Remove old hoses from supply taps. 3. Hand-tighten your new supply hoses onto the supply taps. Then give another ¼ turn each with a pair of pliers. 4. Hand-tighten the other end of your new supply hoses onto the corresponding inlets on your washer (hot to hot, cold to cold). Then give another ¼ turn each with a pair of pliers. 5. Turn on supply taps and check for leaks at all connections. Enjoy years and years of hassle-free service! 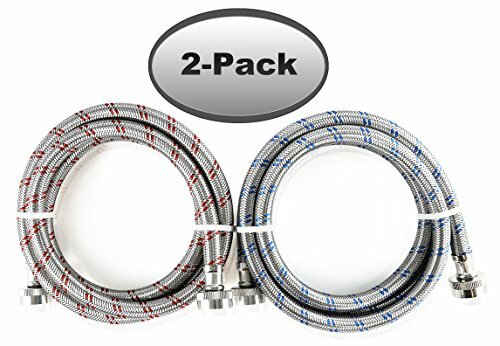 These hoses will outlast your washing machine – and the next one!► TWO 6′ STAINLESS STEEL HOSES – 6 foot long hoses means enough length that you won’t have to shut off your water supply and disconnect your hoses if you need to get behind your washing machine. ► HOT AND COLD WATER SUPPLY – These hoses may be used interchangeably as hot or cold washing machine hoses. Never worry about which is which. ► BURST PROOF – Our super-high tensile strength braided stainless steel ensures maximum pressure retaining qualities, completely burst-proof. Never worry about hose-burst floods again! These hoses will outlast your washing machine – and the next one! ► 100% SATISFACTION GUARANTEE – If for any reason our hoses do not meet your expectations, simply email us back for a full refund! ► UNIVERSAL FIT – The 3/4″ NPT connections on either end are a perfect fit for your washer and supply tap!